Home Product Focus A proper skin care regime isn’t just for the ladies! Even in today’s society, where immaculately groomed men such as David Beckham and Christiano Ronaldo are seen as modern day role models, many men still think that following a proper skin care regime is seen as ‘girly’. Although it’s unlikely to be a topic of conversation in the pub with the lads on a Friday night, looking after skin is just as important for men as it is for women, in order to keep it healthy and looking younger for longer. In the past, a man’s idea of skin care was a quick shave in the morning, although now more and more men are realising that this is seriously insufficient. Another common faux pas that many men make is using their partner’s skin care products. This isn’t the best idea, as men’s and women’s skin has different needs, and a man may have a completely different skin type to his other half. 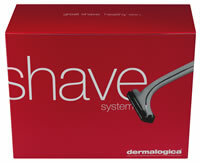 Shaving can leave men’s skin extremely dry, so after cleansing it’s essential to use a hydrating moisturiser. A great starting point for guy’s who really want to get their foot on the skin care ladder is investing in the Dermalogica Shave System Kit. The set contains Daily Clean Scrub, Pre Shave Guard, Soothing Shave Cream, Post Shave Balm and Daily Defence Block- everything that is needed for a smooth shave and healthier skin.